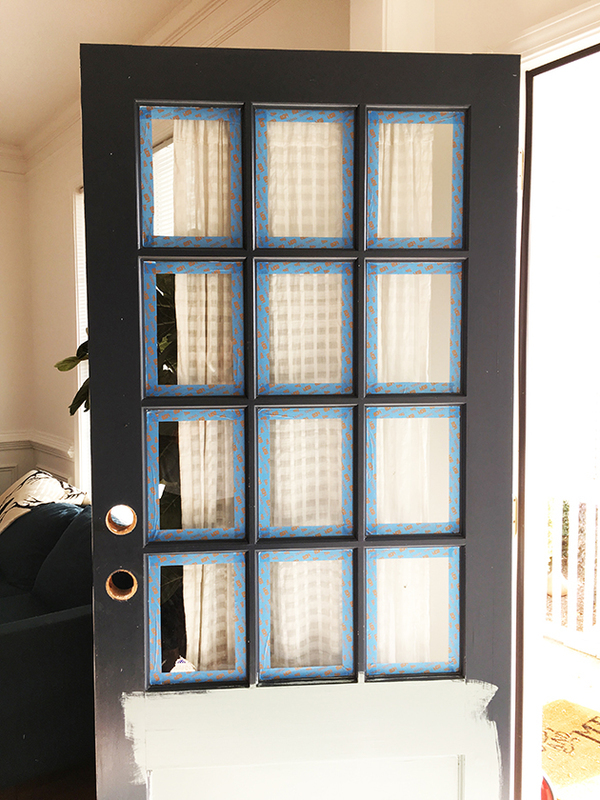 The first step to the door makeover was removing all hardware and taping the edges of the window frames and door edges with painters tape. I went back and forth on selecting an exterior paint color for weeks before deciding on “Rainy Afternoon” by Behr. (It was a tie between burnt crimson red.) The door ended up only one coat of exterior paint, and it dried pretty quickly. You can get either a flat, semi-gloss, or gloss finish based on your preference. After the coat of paint, we switched out the handle set. We had pretty standard lock knobs on before the update, and Gabe had been wanting to change the locks, and add more secure ones. He is much better at thinking of safety precautions than I am. So we found a door hardware combo from Schlage that was pleasing to both the guy seeking safety and the gal seeking aesthetics;) We really liked the camelot set with georgian knobs in the matte black paired with the color of the door. Gabe installed a set on both the front and back door of our main floor. 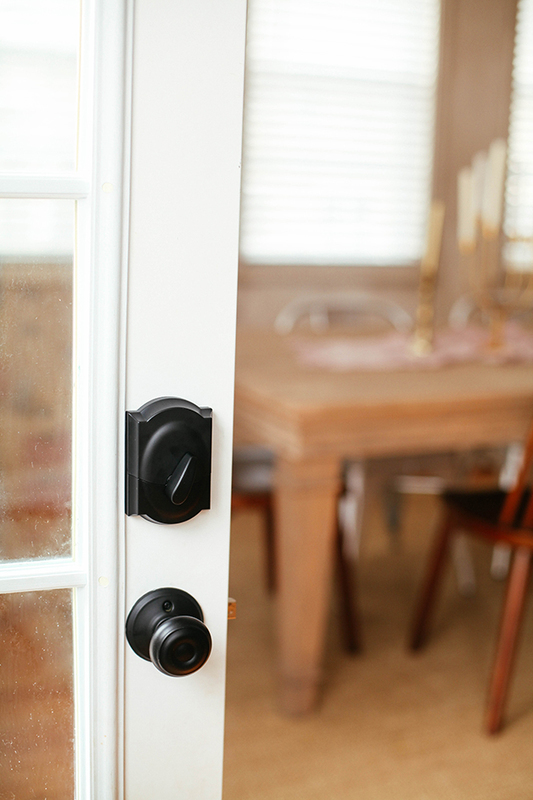 Make sure to get your measurements on your doors and locks correctly before ordering to avoid any misalignment issues. So come on over! The cocoa is ready. P.S. 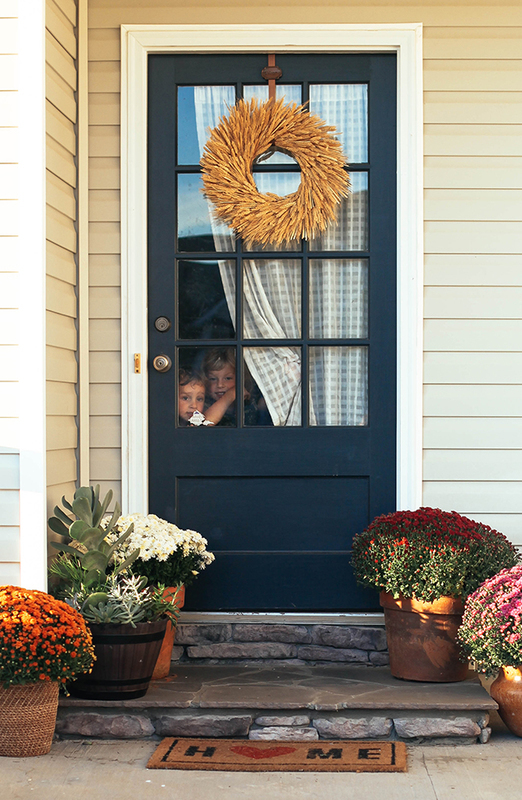 Schlage is running a pretty cool sweepstakes right now giving away daily prizes to give your home a holiday upgrade including gift cards, Schlage door hardware and electronic smart locks, and the grand prize: a $5,000 Lowe’s gift card. Get on that! Schlage products are available online at Amazon.com and Build.com, as well as in retail locations including Home Depot and Lowe’s. To learn more about Schlage and view all their unique decorative door hardware, visit schlage.com. This is a sponsored conversation written by me on behalf of Schlage. The opinions and text are all mine. Love the color and the whole look! So pretty! Love the color. Red is classic but I think this stands out more because it is different. Where did you get the fixture that holds the wreath up? I love it. Your door turned out beautifully! I’ve been afraid of painting ours in fear of messing up and getting paint on the glass! You did an amazing job! 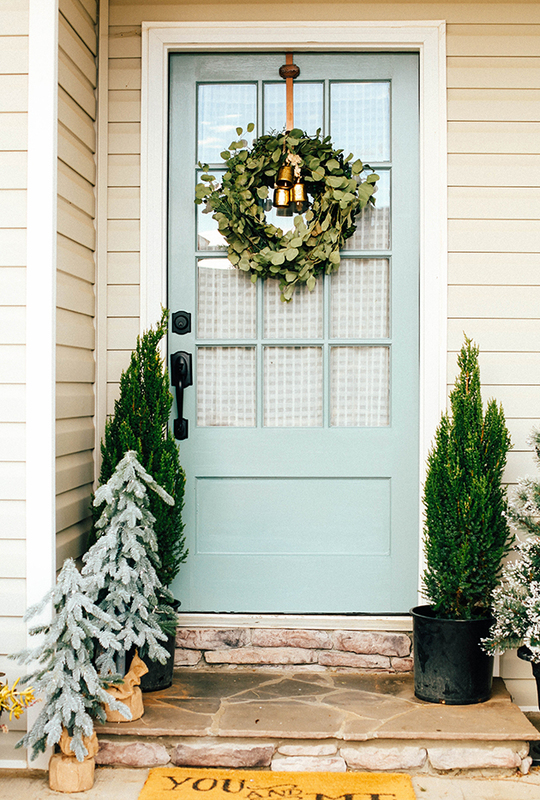 Where did you find your mini fir trees in thin the photo of the updated door? It looks beautiful by the way! Completely in love with the mint colour AND that’s the prettiest wreath i’ve seen this year! Sarah I am so sorry I didn’t see this sooner! The door came with the home, so no help here. I did see some similar ones at Lowes! 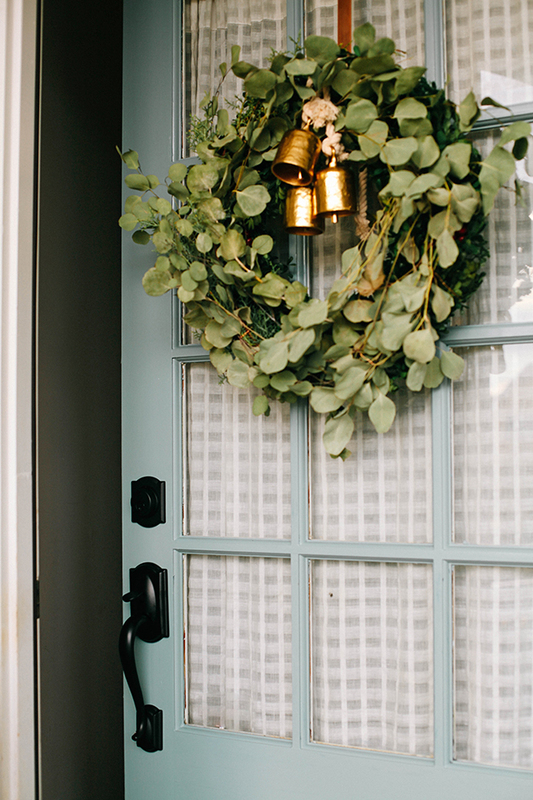 Completely in love with the mint colour AND that’s the prettiest wreath i’ve seen this year….. Your door came out beautifully! I’m scared to paint us with the fear of messing up and painting on the glass! You did a wonderful job! Hi guys, this is random and very detailed but I’m wondering if you could tell me where those door chimes are from or any ideas on how to find them. Thanks so much! Where did you get the door curtains? I love them!!!! I know this is an older post, but I was wondering what your front door handleset looks like on the inside? As in does the deadbolt match the outside or is round?